So as I site here and type my first blog post in a about a week I have had my Trek Rumblefish Elite mountain bike in my hands for two weeks and yet I have failed to go on one single mountain bike ride. You might ask yourself “how can that be, you were so anxious and the weather has been great?” Well let me start by backing up a few weeks and giving you the reader a small bit of personal history. Back at the end of March when I first decided that I would be buying the Trek Rumblefish Elite I decided I would gather up my mountain bike gear including my Sidi Dominator 5 Mountain Bike Shoes and be prepared for a test ride at Class Cycles. The Sidi Dominator 5 Mountain Bike Shoes were in fact the most important item to pack as I had expected to be comparing a few different Shimano mountain bike pedal options. So to that end I headed down to the basement and located my Sidi Dominator 5 Mountain Bike Shoes and tossed them in a plastic grocery bag tying the bag handles in a knot. 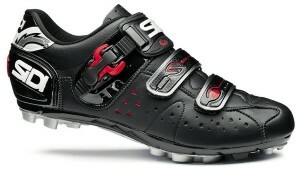 I then proceeded to put the Sidi Dominator 5 MTB Shoes someplace and that is where this mystery begins. Somehow from that time until the day I went to pick up the Trek I managed to misplace the Sidi Dominator 5 Mountain Bike Shoes. They were not found in time to take them to the bike shop. Since bringing the Trek home I have searched my apartment and basement top to bottom in vain. The shoes are nowhere to be found so two nights ago I finally admitted defeat and ordered a brand new pair of mountain bike shoes from Jensen USA . I opted for second day air delivery so I will not lose any more valuable mountain bike riding time, especially since the upcoming weekend is supposed to be gorgeous. Side note: While I refer to my old shoes as Dominator 5’s they were in reality and older version Dominator I have no idea which though. I have no doubt I will love these shoes just as much than their predecessor and I also have no doubt I will find the old ones after my first ride. What the hell, new bike, new helmet why not new shoes too.